Here are examples of how investing in a dynamic and interactive video wall for all-important spaces can deliver dividends (spotlight on the Prysm LPD 6K). Organizations are finding true return on investment when it comes to large-scale, video wall-sized displays in premium spaces that are truly interactive. It wasn’t that long ago a video wall was a rare sight. You’d find them at Las Vegas hotels, museums or the airports. Times have changed and video walls are now found in company lobbies, executive board rooms, university student centers and more. 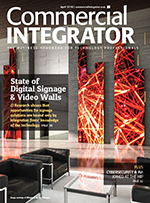 As the adoption of video walls has evolved, so have the expectations. No longer does hanging a video wall in itself deliver an impact. Instead, the video wall “wow factor” is now delivered through the interactive nature of the experience. For today’s tech-savvy customers, the video wall has to be immersive. Otherwise it’s just a shiny wall. Consider the premium spaces within a typical organization. Maybe it’s the meeting room where the company’s most important customer presentations take place. It could be a welcome lobby in which recruits sit and await their interviews. Then again, it could be a point-of-sale location where purchasing decisions are made. These are examples of spaces for which an organization might invest in a video wall. For that investment to fully pay off, however, they really should consider that a “hang and bang” approach will only deliver that shiny wall. It’s essential to also invest in the experience. The integration firms that provide video walls have a responsibility here. They need to frame this value proposition for their customers, but that’s not always easy. Some customers are hesitant about the mere idea of video walls in these spaces. They find multi-panel video walls cumbersome, complicated and difficult to service. The good news for integrators is that part of the video wall evolution includes the move toward more of a single-panel solution for these large-scale displays. 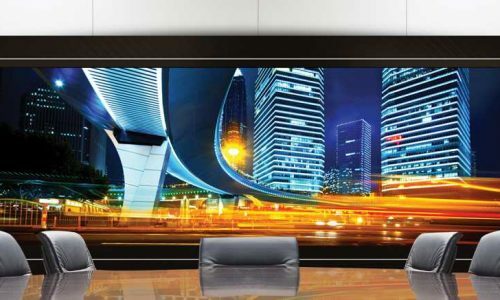 The Prysm LPD 6K series, for instance, offers single panel displays that are 135 or 190 inches, so they deliver the impact of a multi-panel video wall without the seams. As for the all-important interactivity end of the equation, Prysm’s laser phosphor display line coupled with Prysm Application Suite software makes it relatively easy for integrators to deliver an immersive experience. So instead of hanging up a big display, customers understand that they’ve invested in improving employee engagement or adding dimensions to their end user experience with the Prysm LPD 6K. The return on investment is crystal clear – and not just because of the 6K resolution. Most companies agree that employee training is vital to success. Does it follow, therefore, that investing in engaging technology to maximize the impact of training pays dividends? 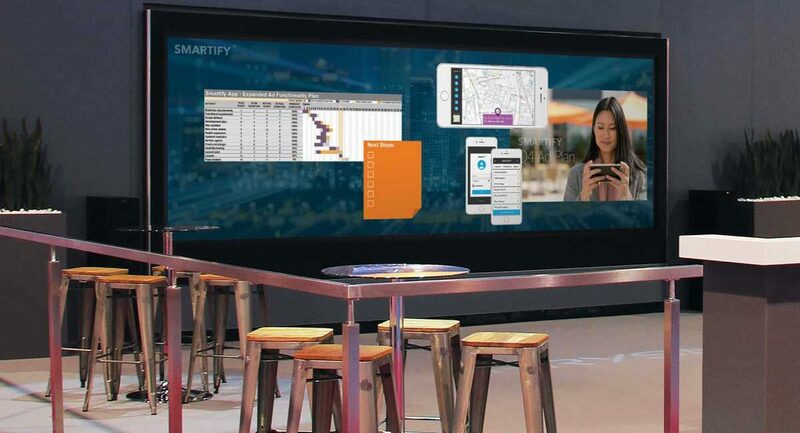 It certainly did for a global organization that invested in large-format Prysm displays and visual collaboration software to create an immersive experience in its training center. As a result, that company reports that it has improved its executive-level client engagement to the point that it attributes $250 million in new business to the immersive training technology. What’s more important to a brand than its story? 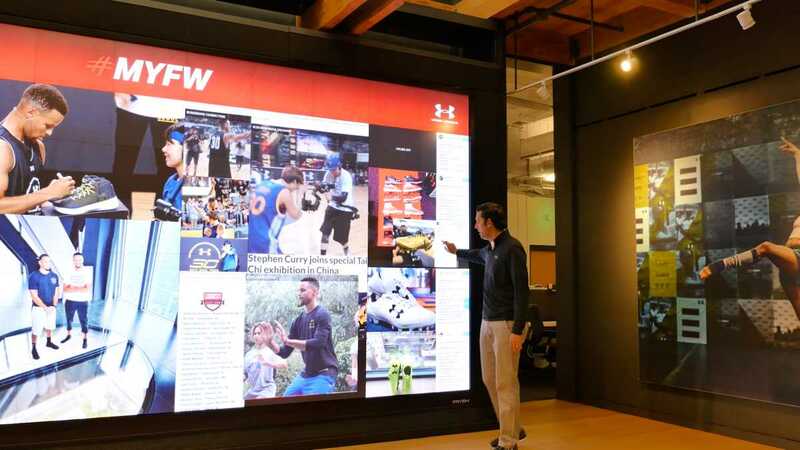 Under Armour invested in its ability to tell its stories by way of its “Make You Famous Wall,” which is an 18-by-9-foot video wall with customized Prysm Visual Workplace on a Prysm LPD 6K. It has proven to be an invaluable tool in recruiting athletes to be brand spokespersons. The idea is that Under Armour creates a personalized presentation to dazzle athletes as they visit the Baltimore headquarters and the Prysm platform helps that message to pop. “The Prysm solution is a massive canvas where we can display a large variety of content to demonstrate how we’re telling their story, not just in Baltimore, but all over the world,” says Kevin McDermond, program director for Under Armour’s brand creative team. It goes without saying that for a brand like Under Armour successfully courting effective spokespersons pays off exponentially. Most organizations probably suspect that their typical meetings could be more productive with less time scampering to pull up material and struggling to interact with remote employees. One company reports that it went so far as to track the efficiency of its meetings and determined that in a typical 60-minute meeting only 35 minutes are actually productive. After investing in immersive video collaboration technology it found that was able to add an additional 10 minutes of productivity to typical meetings. For this global organization, it estimates the cumulative impact to be worth about $150 million per year in productivity. Standard Practices invested in a 190-inch Prysm LPD 6K solution. Important presentations deserve their best opportunity to succeed. Whether it’s an advertising pitch to a customer or an appeal for public funding, organizations need a platform to present their point of view. Standard Processes, a health care provider of nutritional supplements, needed a platform to present to medical professionals and policy makers its position that holistic nutrition standards be better incorporated into health care practices. The bulk of those presentations happen in the Standard Process media and learning center where it invested in a 190-inch Prysm LPD 6K solution, says Dr. John Troup, VP of clinical science, innovation and education. Adding the immersive video application has opened up new presentation opportunities for Standard Process. 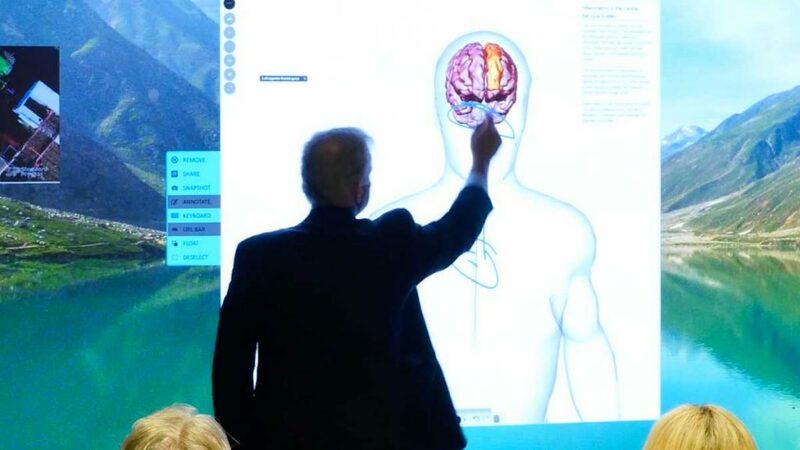 Troup says it now uses augmented reality and three-dimensional features to “visually demonstrate” to medical professionals how nutrition impacts the human body. “Practitioners come up to the screen and can twist and turn the virtual body around, examining it from multiple perspectives as if it were a real, live patient,” he says. These are effects that can’t be achieved simply by adding a big screen. 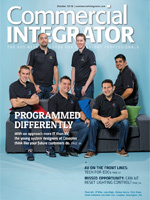 The good news for integration firms and their customers is that they don’t have to rely on just words. 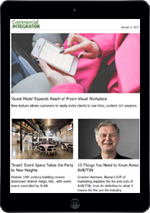 Especially in their premium spaces where interactive engagement can make a particularly vital impact, investing in next-level solutions makes good business sense. The days of hanging and banging out a video wall are over. Luckily the era of making it easy to achieve interactive, large-scale video content in premium spaces is just beginning. 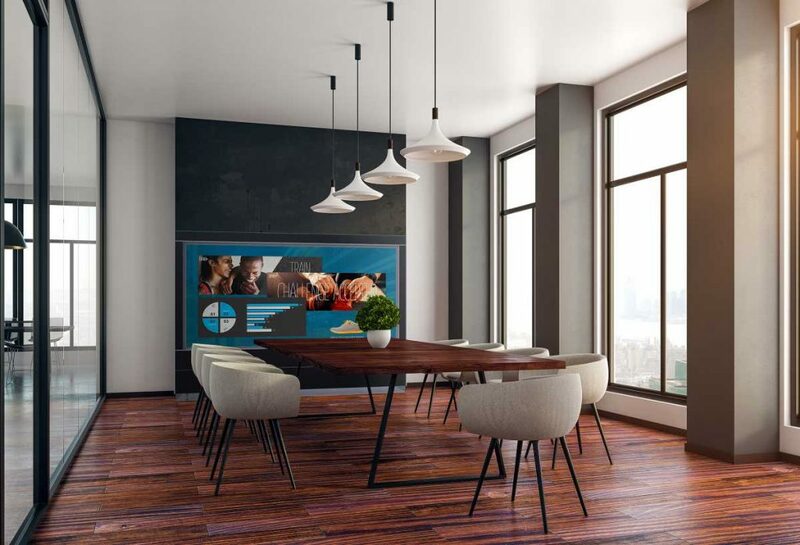 Interactive large displays like this Prysm LPD 6K are well-suited for premium work spaces.